Burgers. There's no wrong time to eat one. Well, maybe like a funeral or something. Don't be ridiculous. But still, there are plenty of GREAT times for a great burger, which means you want to make sure you're never too far from one. 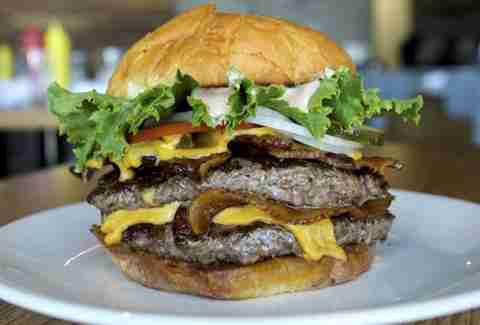 With that in mind, we sought out the best examples of beef between buns in nine prominent Denver 'hoods. Nestled on the corner of Wynkoop and 15th, The Squeaky Bean slings out some seriously star-spangled burgers. 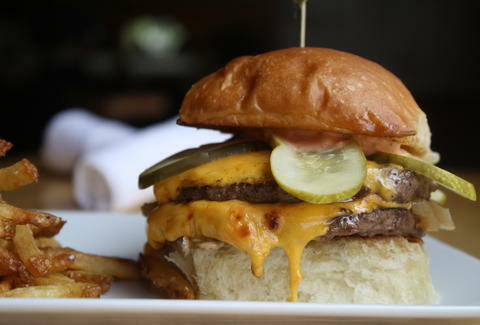 Their two 6oz beef patties (with grilled onions in between) are topped off with pickle slices and proudly draped in gloriously gooey American cheese. The preservatives are for preserving our freedoms. 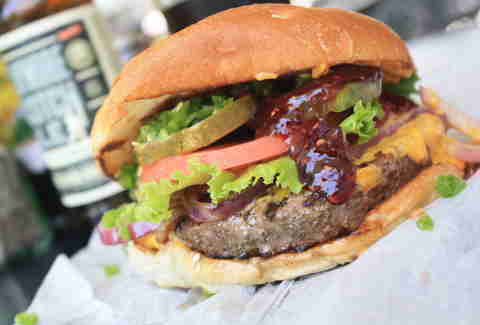 The Cherry Cricket is a neighborhood (not to mention Denver) staple when it comes to grillin’ beef patties. They let you customize the hell out of your burger with more than 30 toppings -- from standards to more unusual options like peanut butter, raspberry jam, cream cheese, and grilled pineapple. The jam in particular is surprisingly delicious. The "Farm, Fish, Wine" spot has been making waves with their seafood (get it?!) since they opened almost a year ago, but their burger will make you avert your attention back to land. Their patty is a bacon and beef blend from Crystal River Farms with Bibb lettuce, crispy onion, Tillamook cheddar, and a perfectly flavored onion jam. Sorry sea creatures! 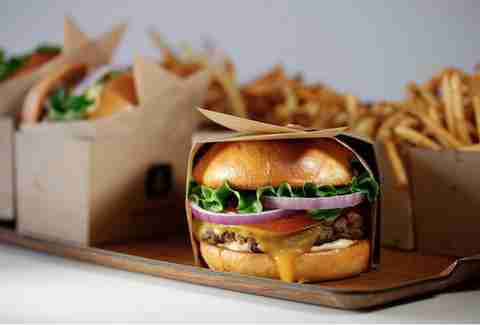 If you are looking for a fast-food burger without all the downsides of a fast-food burger, then get thee to Larkburger, which has multiple locations but is definitely the move when you need a burger Downtown. The Truffle Burger steals the show with a fresh-made truffle aioli topping an Angus beef patty, a classic LTO setup, and crunchy dill. Being on the corner of Platte and 15th does not make this place any easier to find, but once you pass the threshold and smell the flat top sizzling beef and bison burgers, you’ll know you are in the right spot. 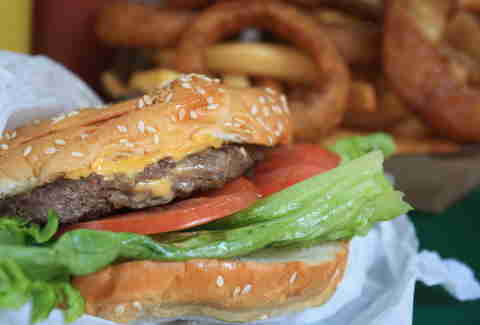 Simply topped with lettuce, tomato, and a fixin's tray on the side, their burgers have the key elements to compose a symphony in your mouth (the classical music you're hearing could be burger bliss, but it also could be the actual classical music they play there). 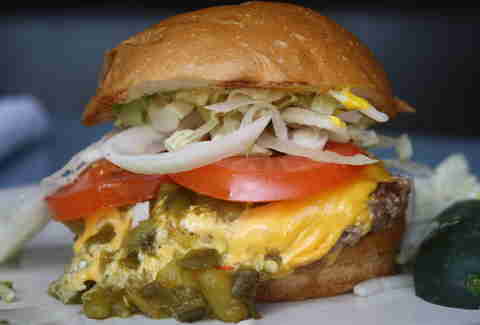 Stealing the spotlight in Platt Park is Park Burger. These guys call a couple of spots in Denver home, but their standard of grilling quality runs across the board. They do fancy (think ahi tuna, truffle, and croque burgers) just fine, but when it comes down to it, their classic bacon cheeseburger is timeless. 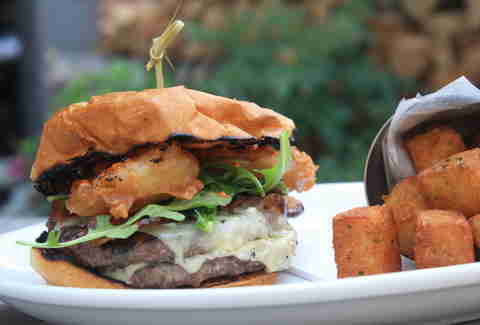 Chef Amos Watts plays culinary tailor and refines the burger by dressing it up with Gruyere cheese, Tender Belly applewood-smoked bacon, arugula, harissa aioli, and tempura-fried pickles. He will not do any tailoring once your pants no longer fit. The folks at The Populist wrangle in some Colorado greats to craft their creation. 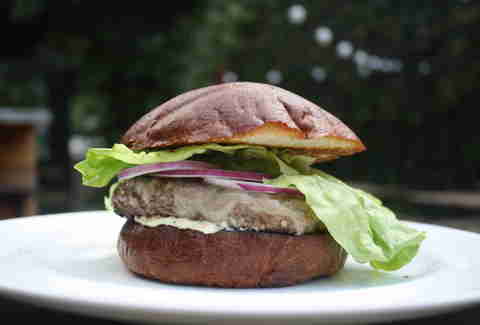 A (get ready for the name-dropping) Windsor Dairy/Funkwerks Tropic King white cheddar cheese, red onion, and Bibb lettuce-topped Colorful Ranch grass-fed beef patty sits between Babette Bakery’s brioche buns, which are as delicious as they are alliterative. *In the interest of full disclosure, the author of this article also works at Steuben's. 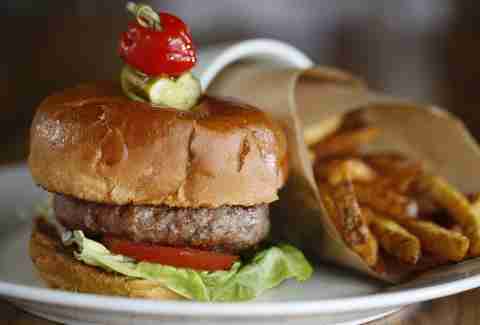 However, other non-Steuben's employed Thrillist Denver associates will vouch for the deliciousness of the burger in question.